You are here: Home » Bright Spots | Take on Half an Ironman? Bright Spots | Take on Half an Ironman? Bobby Jacobsen, former homeschooler and oldest son of Bob and Susan Jacobsen, President of MassHOPE (Massachusetts state homeschool organization), has been training to participate in yet another half-ironman to raise funds for the Home School Foundation Compassion Fund. He participated in one last July and is doing it again. He will be consecutively swimming 1.2 miles, biking 56 miles and running 13.1 miles and hopes to raise $5,000 to benefit needy home school families. Now that is dedication. The ironman event will take place Sunday, July 8th, 2012 in Providence, RI, starting at 6am. Hello! I am participating in another Ironman fundraiser for HSF on July 8th and I am asking my friends and family to help me raise $5000 for The Home School Foundation. ( I participated in one last July to also help raise money for HSF). I chose The Home School Foundation because of the important role it plays in helping families get and maintain the ability to homeschool their children. Homeschooling is often a tough decision financially even in a good economy because in most cases it reduces the household income to a single salary. Now with the bleak economic conditions we are facing as a nation (and not to mention the global economic issues), The Homeschool Foundation is becoming an increasing necessity for parents to be able to provide the solid, Christian based education they desire for their children. Please consider giving to my Wish for Ironman fundraiser for HSF, and together we can provide assistance for homeschooling families in need. If you can’t give now, I’d really appreciate if you’d share this page with your friends. I would ask if you could please consider giving to Bobby’s Ironman fundraiser for HSF! And if you can’t give now, please share this page with others. But most importantly, please keep Bobby in your prayers as he completes the Ironman. And the Home School Foundation in your prayers as they strive to help needy homeschool families! 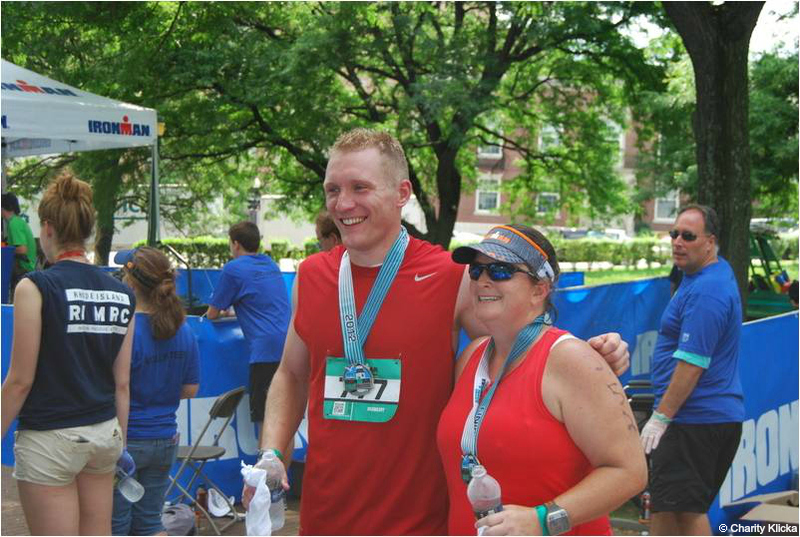 Photo Credit: Taken by Charity Klicka, at the finish line just after Bobby completed the race.